The Qatar Flag is white on the left hand side and maroon on the right hand side. The two colors are divided by nine serrated white edges. 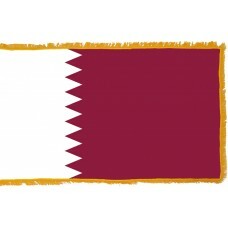 The color of the flag represents peace and the maroon color represents the blood shed during the various Qatari wars. The nine white serrated edges represent Qatar being included as the ninth member of the "reconciled emirates." The Qatar flag was adopted on September 3rd, 1971 and is the only flag where the width is twice the length of the height. 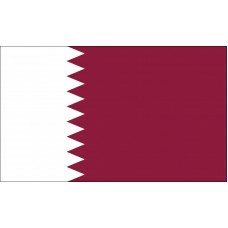 The Qatar flag holds very close resemblance to the Bahrain Flag. Qatar (known as the State of Qatar) is located in Asia and shares a border with Saudi Arabia and is surrounded by the Persian Gulf. The capital and largest city of Qatar is called Doha. Over half of Qatar's population live in Doha and it is the fastest growing city in Qatar. The second largest city is called Al Wakrah. Qatar is thought to be one of the richest countries in the world today with oil exportation being its biggest income. It is also a very big exporter of natural gas. The oil in Qatar was discovered during the 1940s and by the 1950s it had become the main revenue and the biggest contributor to the economy. It is thought that the first settlements in Qatar existed in the stone age from relics that have been found and discovered over the years. From 1871-1915, Qatar was under the Ottoman rule, until it became a British Protectorate on November 3rd, 1916. In 1968, the British announced that they would be withdrawing from Qatar and on September 3rd, 1971, Qatar became an independent nation. As well as the oil and gas, tourism has started to also contribute to the economy. The main tourist attraction is the "Aspire Academy Sports Dome" that is located in Doha. It is one of the biggest sports domes in the world and features a 200m track, diving pool, Olympic-sized pool, full length football pitch, squash courts, and many other various sports areas. Another attraction is the "Zubarah" which is also classed as a world heritage site and it is an ancient fort and ruins that were founded during the early 18th century. The "Imam Abdul Wahhab Mosque" also known as the "State Grand Mosque" is the largest mosque that Qatar is home to and has 90 domes. The small village of Al Thakira is also recommended to tourists as there is a wide variety of marine life to be seen. It is expected to attract a lot more tourists over the next few years and get more popular, especially as the 2022 football World Cup will be held here, which makes Qatar the first Arab country (as well as the smallest country) to ever host the world cup.